Microsoft Visual Studio 2015 is the new version of the widely-used integrated development environment for building modern, high-quality applications for a number of platforms such as Windows, the web, the cloud, and mobile devices. 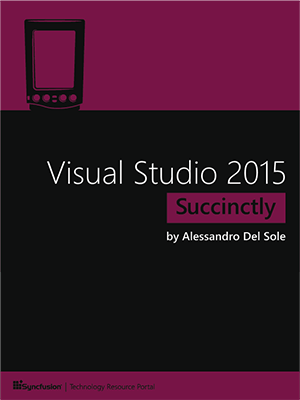 In Visual Studio 2015 Succinctly, author Alessandro Del Sole explains how to take advantage of the most useful of these highly anticipated features. Today is an exciting day for Windows users and developers alike with the launch of Windows 10. For developers, Windows 10 represents the culmination of our platform convergence journey with Windows running on a single, unified Windows core. This convergence enables one app targeting the Universal Windows Platform to run on every Windows device – on the phone in your pocket, the tablet or laptop in your bag, the PC on your desk, and the Xbox console in your living room. And that’s not even mentioning all the new devices being added to the Windows family, including the HoloLens, Surface Hub, and IoT devices like the Raspberry Pi 2. All these Windows devices will access one unified Store for app acquisition, distribution and updates. In the MVC pattern, Views are supposed to be so brain-dead simple that they don't require testing: all your logic should be in your Controller, which can be tested using test-driven development (TDD) tools. In addition, in the MVC pattern, program logic and presentation are supposed to be loosely coupled. In ASP.NET MVC, changes to the way the application presents itself should only require changes to the HTML in the relevant View -- not changes to the application's program logic. In another column I showed how to leverage ASP.NET Partial Views to achieve those goals. In this blog post I’m going to talk about IntelliTrace’s default configuration and the ability to opt-in to capture method call information. If you haven’t done so already, check out the announcement of IntelliTrace in Visual Studio 2015 which gives you an overview of IntelliTrace and its improved UI. If you’re not already familiar with IntelliTrace, that post will help set the context. In 1992, I thought I was the best programmer in the world. In my defense, I had just graduated from college, this was pre-Internet, and I lived in Boulder, Colorado working in small business jobs where I was lucky to even hear about other programmers much less meet them. I recently received an email from a reader of my blog that, for whatever reason, really got me thinking. Here’s what it said: Hi Philip, is it okay to ask how you become a great front-end engineer? Any advice? ASP.NET 5 has dependcy injection available at framework level and ASP.NET 5 makes heavy use of it. Most of things surrounding controllers, views and other MVC components are implemented as services that web applications consume. This post is quick overview of dependency injection in ASP.NET 5 with some examples. In this entry we're continuing the discussion of Entity Framework by looking toward the future. We focus primarily on EF7 and its primary design decisions.